The 2019 Nottingham Open combines both the ATP Challenger Event (Men’s) and WTA International Event (Women’s) into one breathtaking tournament. The format will allow guests to see world-class men’s and women’s tennis at the same venue in the same week – with 129 players competing in 108 magnificent matches across both Singles and Doubles Events. The ATP event was won by Australian Alex de Minaur, in 2018 as he defeated former British No.2, Dan Evans and becoming the youngest man to win a title at Nottingham since 2014; while the Nottingham Open WTA event was won by World No.17, Ashleigh Barty, who beat British No.1, Johanna Konta 6-3, 3-6, 6-4 to claim her first Tour-level triumph on grass. 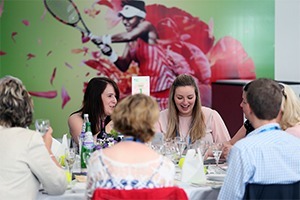 Please be aware that unfortunately, the LTA will not be providing a hospitality option at the 2019 Nottingham Open. We would be delighted to offer you an alternative at any of the other tennis tournaments featured on our site. Please accept our apologies for any inconvenience. The luxurious Sherwood Suite provides guests with a stylish backdrop to a quintessentially British day of tennis. I was pleasantly surprised by the quality of tennis played at the Open. I will be back next year!